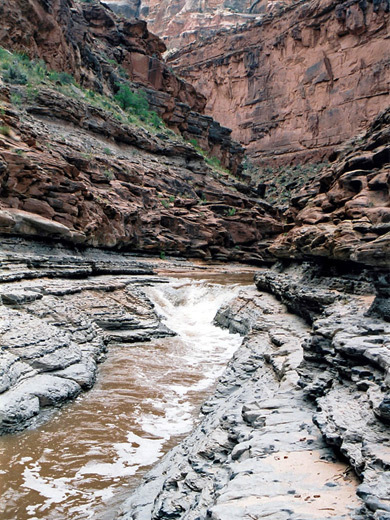 The Sundance Trail is the one easy route into Dark Canyon, joining it at the deepest section, opposite Lean-To Canyon and 3 miles above the end of the gorge at the Colorado River. Most of the trail is over land of the Glen Canyon NRA though the Dark Canyon Primitive Area begins just upstream. The dirt road to the trailhead (county roads 2081 & 256) is usually good for all vehicles at least from spring to fall; it begins near milepost 49 of UT 95, crosses some uneven ground before levelling out, follows beneath Browns Rim mesa for several miles and meets another track (county road 2731) that provides an alternative start point from UT 95 near milepost 53, then continues east, past five junctions with lesser tracks (two of which are used to reach Fortknocker Canyon) to a BLM notice and parking area, 11 miles from the highway. 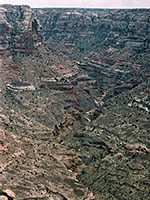 The main route continues east, becomes rougher, and passes close to various other canyons. From the trailhead, the cairned, 3 mile path to the canyon floor heads north through a sandy plateau bearing juniper bushes and scattered echinocereus & opuntia cacti, over the very upper end of Sheep Canyon and into more flat slickrock land beyond. At one point it crosses a disused 4WD track that leads northwest, across Dry Mesa to a viewpoint above Cataract Canyon and the Colorado River. On the Sundance Trail, Dark Canyon first comes into view as the path traverses the north edge of a short side ravine and descends quite gradually until near the end; it comes close to the rim of the main gorge before bending back south and dropping very steeply via a boulder-strewn slope to the valley floor, down 1,000 feet in less than a mile. The final stretch is along a streambed, descending to a tree-lined area beside the stream of the main canyon, which has various places for primitive camping. Once at the end of the official trail, options are to follow a lesser path up Dark Canyon, enter the nearby tributaries of Lean-To and Lost canyons or explore the lower gorge, perhaps as far as the Colorado River/Lake Powell. This latter trip encounters the best scenery, as here the canyon contains a sizeable stream flowing over many waterfalls, pools and cascades, with level terraces in between. In some places the stream cuts into an unusual grey-blue limestone layer made up of many thin strata, forming quite a narrow V-shaped channel. A faint path runs on ledges above the stream for a while, to bypass some of the larger waterfalls, though most of the route is in or alongside the water. The trip is possible most of the year, except after heavy rains which can cause the water levels to rise significantly. A hike up or down the Sundance Trail can take less than 90 minutes, though for those with large packs, or during hot weather, twice this time may be needed.